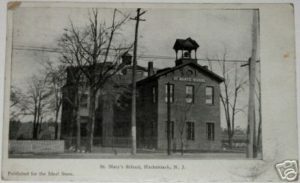 Immaculate Conception Parish came into being on August 21, 1890 with a purchase of land in the southern section of Hackensack. Most Rev. Winand M. Wigger, Bishop of the Diocese of Newark, sent Michael J. Russell, curate of Holy Trinity Church, to direct the establishment of this new parish. In 1 891, Rev. John Hennes was appointed the first resident pastor of St. Mary’s, as the new church came to be called from the beginning. Official incorporation on June 5, 1891, however, was under the name of the Church of the Immaculate Conception. Charles Reinhard of Ridgefield Park was awarded the contract to construct a frame building with high gothic windows and a belfry. 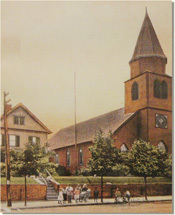 The cornerstone was laid on June 8, 1891 and officially dedicated on November 8, 1891. The cost of the church and furnishings was $8,900. Rev. John E. Lambert was appointed pastor a year later. He is best remembered for the establishment of Immaculate Conception School in 1904. The school was staffed by three Benedictine sisters of Elizabeth. Father Lambert remained here for 21 years. He was succeeded by Rev. Joseph F. Dolan in 1913. He was responsible for an addition to the school and also the installation of the replica of the grotto of Our Lady of Lourdes in 1915. Rev. 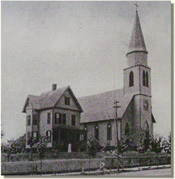 John F. O’Malley became pastor in 1919 and effected many improvements including the remodeling of the exterior of the church. All work was done by the men of the congregation. I n 1925, Rev. John F. Maxwell came and remained for 12 years. He inaugurated a weekly Novena for St. Theresa, the Little Flower of Jesus, held each Sunday afternoon. Rev. John J. Kinney continued this fine tradition until his death in 1924. During World War II Rev. Matthias J. Boylan (1940-1942), Rev. Thomas F. Curry (1942-1943), and Rev. John M. Nuberg (1943-1945) served as pastors. Extensive improvements were made to the exterior of the church during this time including a coating of simulated red brick. Rev. Joseph M. Murphy decided to purchase some land adjoining the school property in 1946. Although controversial at the time, it proved vital for the preservation of the school. In 1954, Rev. Thomas G. Grant came to our parish. During his time, the construction of route 80 cut into our parish, eliminating 40 families and our school. In 1960, plans were completed for construction of a new school and convent. The buildings were dedicated on November 25, 1961 by the Most Rev. Thomas A. Boland, Archbishop of Newark. Rev. James R. O’Neill became pastor in 1966. The exteriors of the church and rectory were covered with a coating of simulated brick known as brickote, which is still there today. Extensive interior renovations were also completed. In 1970, Rev. Thomas F. Lynch became pastor. Under his guidance, new windows (1975) and new pews (1988) have further enhanced the beauty and serenity of our church. Throughout the last century, the Church of the Immaculate Conception has done much to lift up spirits and gladden hearts of those nearby. It continues its proud tradition to serve the community, the nation, and God. Please visit our MUSIC page to practice or listen to our next Sunday Mass songs. Click on the song title to automatically play it. Copyright © 2019 IMMACULATE CONCEPTION CHURCH.